JCPenney is treating its customers like VIPs with a storewide sale event that offers big savings. 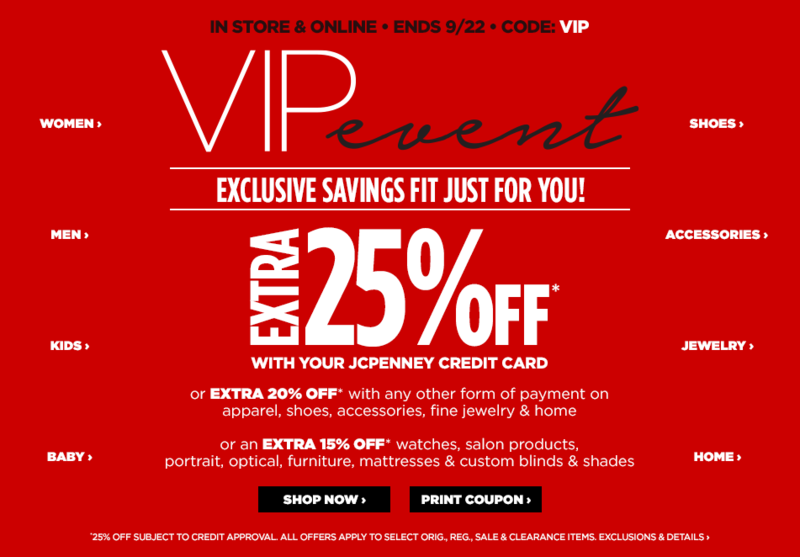 For a limited time, the department store is taking an extra 25% off qualifying purchases for shoppers who use their JCPenney credit card. Shoppers who use any other form of payment will receive an extra 20% off on select purchases of apparel, shoes, accessories, fine jewelry and home products. Additionally, customers will receive an extra 15% off select watches, salon products, portrait, optical, furniture, mattresses and custom blinds and shades. This promotion ends today (Sept. 22). It’s valid both in-store and online. Online shoppers should enter coupon code VIP at checkout, while in-store customers should print a coupon to present to their cashier. For more tips for shopping at JCPenney, consult our JCPenney Store Guide. Find this deal at JCPenney.